In the far north of Italy, the bringer of gifts is St Nicholas, who comes on December the 6th, while children who have not been good may expect a visit from the dreaded Krampus (see page 54). In the south, children will wait until January the 5th for their presents, when the Befana comes flying by on her broomstick. But everywhere, the cult of Father Christmas is also recognised – though in Venice he is as likely to arrive in a gondola as on a sled. 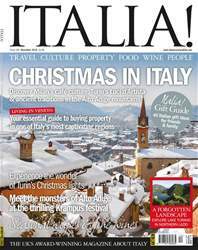 There’s a seasonal feel to the pages this month, kicking off with our Gift Guide, which is full to the brim with Italian treats and gifts for friends and family. We travel to Piedmont, where Turin takes Christmas lights to another level with sophisticated displays that will take your breath away; and on to Milan, where the city’s best cafés are wrapped up in Christmas cheer. To escape from it all, we discover the forgotten history of a quiet corner of Lazio that’s right off the beaten track, marvel at the extraordinary Krampus tradition, and attend a chestnut festival near Viterbo.